Ocean Princess has two specialty restaurants. Both are located on Deck 10 - - Sabatini's on the port side and the Sterling Steakhouse on the starboard side. Only one specialty restaurant is open each evening. Thus, on certain nights during the cruise, Sabatini's will be open and on the other nights, the Sterling Steakhouse will be open. Sabatini's is Italian fine dining. It is not a pizzeria. Set in a light colored room with a classical freeze running around the interior walls. It offers multi-course meals featuring upscale Italian cuisine. For many years, Sabatini's followed a traditional Italian model where the guest was automatically presented with numerous courses. Now, guests select which courses to have. As a result, it is now up to the guest to decide how much food to eat and how long the dinner will take. The Sterling Steakhouse is decorated like an upscale steakhouse with dark wood paneling. Its menu is similar to the larger Crown Grill steakhouses on Princess' Crown class ships. “It is a high quality of premium meats that we do not serve anywhere else, only served in the Steakhouse,” the Chef noted. There are cover charges for both restaurants. In addition to the restaurants, Ocean Princess offers several dining events. The Chef's Table is a multi-course feast and wine pairing. It is a gourmet event that allows the chef and his staff to go all out. It is limited to a small number of guests and is offered once or twice a cruise. There is a cover charge for the Chef's Table, which includes the wine. On sea days, the Ocean Princess has a British Pub Lunch. Guests are seated in the Sterling Steakhouse and can order pub food favorites off a short menu. They can also order drinks. There is no charge for the food but usual bar prices apply for the drinks. 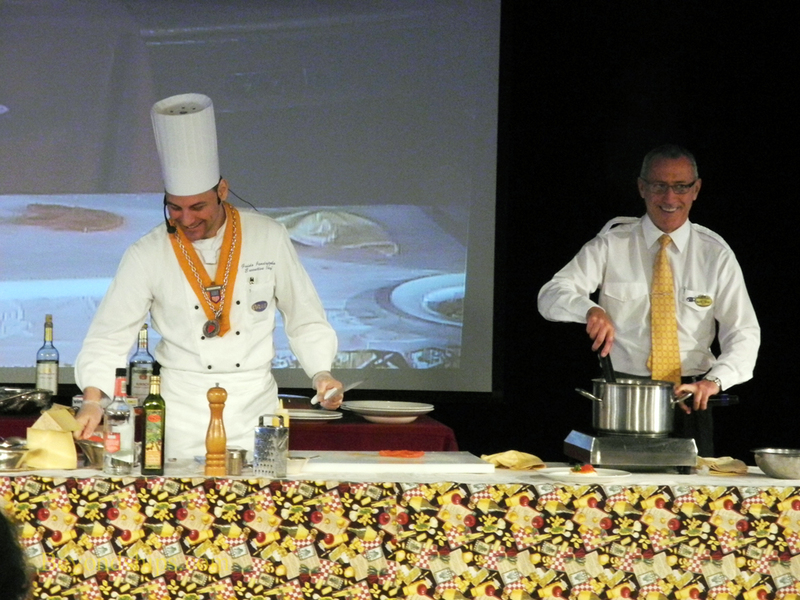 Above: The Chef and the Maire D' give a cooking demonstration in the Cabaret Lounge. Left: A dinner in Sabatini's.